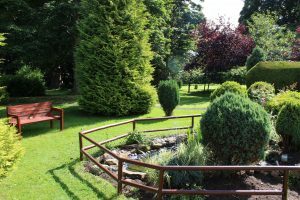 Nazareth House is surrounded by beautiful gardens in Bonnyrigg which is to the South side of Edinburgh. The Sisters of Nazareth founded by Victoire Larmenier have been resident here in Bonnyrigg since 1931 and can still today be found attending and supporting the residents of all denominations with their spiritual well being or even a cup of tea and a chat. Well trained staff are on hand to look after our residents and promote their individuality by devising a “tailor made” plan of care to reflect residents needs and wishes. Residents are encouraged to stay active by joining in any or all of the many activities such as armchair exercises, outings and concerts. Their opinions are actively sought to devise new or vary activities within the home to suit each individuals needs.